Maybe Jackson Hurst's gorgeous mug got him ahead in show business, but he looks even better when you consider his banking background. 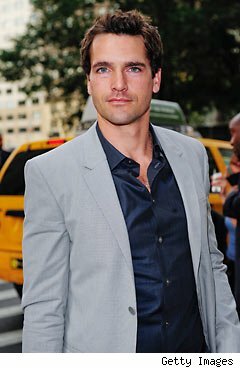 Hurst, the 32-year-old star of Lifetime's Drop Dead Diva (9 p.m. Sundays), worked in high finance at Citigroup (C) before shedding his gray flannel to become an actor. Hurst, who also tops the marquee in the romantic indie comedy A Bird of the Air (opening Sept. 23), was recruited in 1999 by an elite Citi training program that grooms candidates for management. He then climbed the ranks, landing a lofty executive gig in which he managed relationships between Citi and automakers such as Chrysler, Mercedes and GM. When you've hung with titans of industry while earning a healthy paycheck, managing a thespian career can seem tame. "There's definitely a business way of thinking," he told The Price of Fame. "If you think too much with your heart, you sometimes put yourself in a bind." Hurst has no business manager and handles all of his money, including the investment calls. The only difference now that fame has kissed his chiseled cheeks is that he has people who push the buttons to finalize the stock trades. "If you're an actor or director, you're running your own personal business," he said. "I budget and maintain my money pretty well." For a few years, Hurst relished having the key to the executive washroom. But he apparently felt like a briefcase stiff trapped in Warren Beatty's body. He wanted to perform, just as he did at St. Pius X High School in his native Houston, and at Baylor University in Waco, Texas, where he juggled drama with majors in international economics and management information systems -- the slacker. So he walked away from his steady, Texas-sized salary in Dallas for the life of a struggling actor in Austin. During what he describes as a "moment of crisis," the electric company shut off his power and he didn't pay his phone bill. Old buttoned-down colleagues might have called that being a deadbeat. In his new reality, Hurst was simply doing what he truly wanted to do. "I realized I was happier broke pursuing my dream than being content in making a ton of money," he said. "You gotta follow your heart." It worked out. He worked pay-the-bills jobs while landing TV and film parts in the Southwest. One of them was in a Lifetime Original Movie called Living Proof that was shot locally, which led to an invite from the film's executive producers to audition for a series they were working on. That turned out to be Drop Dead Diva, in which Hurst's character, a lawyer, connects with a zaftig and dynamic colleague (Brooke Elliott) who houses the soul of his deceased model girlfriend. Studies have shown that being attractive is an asset in the workaday world, where the slim and handsome tend to make 5% more than their colleagues. Being good-looking in TV is even more critical. But Hurst said it could have been an obstacle for him in A Bird of the Air, in which he plays a lonely night patrolman who joins a librarian (Rachel Nichols) in search of a parrot. At the time of casting, producers apparently wanted less in-your-face beefcake. "They were hesitant in hiring me because that came up," he said. "When I came into the room, I showed them that it's not an issue. If the right role comes along, you can almost transform yourself physically the way you play the role emotionally." 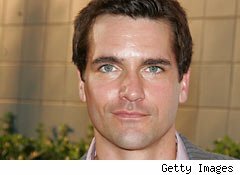 As for the romantic fate of Hurst's Grayson Kent and Elliott's Jane Bingum on Drop Dead Diva, Hurst urged viewers to tune in for the third season's final few episodes, concluding Sept. 18. Then, who knows? As of this writing, he had not heard whether Diva will be renewed. The former money strategist in Hurst is prepared either way. He's been smart with his savings, and he recently shot a guest arc on the new Maria Bello vehicle Prime Suspect on NBC (10 p.m. Thursdays). Besides, Hurst made it on his terms a few years ago -- and none of it had to do with dollars and cents. It was when he received a phone call from director Terrence Malick about a role in The Tree of Life, the polarizing movie with Brad Pitt. Hurst said that even though his part ended up on the cutting room floor for the theatrical release, he can still feel the validation. "Getting a phone call like that makes you realize everything's worth it."